Founded in 1933, the American Board of Pediatrics (ABP) is one of the 24 certifying boards of the American Board of Medical Specialties (ABMS). The ABP is an independent, nonprofit organization whose certificate is recognized throughout the world as a credential signifying a high level of physician competence. Have questions? We've got answers. What is the American Board of Pediatrics? The American Board of Pediatrics (ABP) is the non-profit organization dedicated to serving children by certifying that a pediatrician (a physician who treats children) is knowledgeable and continues to learn over the course of time that they practice. Does having a medical degree mean that my pediatrician is board certified? What does it mean to be certified? Are all pediatricians board-certified? Board certification is a voluntary process that goes above and beyond state licensing requirements for practicing medicine. It is an ongoing commitment by physicians to continually expand their knowledge in a medical specialty, like pediatrics, or in a subspecialty, such as pediatric hematology/oncology. Once pediatricians are certified, they must continue to demonstrate learning through a formal Maintenance of Certification program if they want to remain certified. Therefore, not all pediatricians are board certified. How does a pediatrician become certified? After physicians graduate from medical school, they enter a three-year accredited residency training program focused on pediatrics. After residency, some pediatricians also go on to complete further accredited training in pediatric subspecialty fellowship programs (see list of subspecialties below), while others enter into general pediatric practice. After completion of training, the training program director verifies to the ABP that the candidate is competent in all aspects of the practice of pediatrics (medical knowledge, patient care, communication skills, practice improvement, professionalism, and understanding how the medical system works). Once the ABP has received evidence of these competencies, the candidate is eligible to sit for the initial certifying examination of the ABP, the first part of a rigorous on-going process of assessing the knowledge and skills of a pediatrician to determine if he or she meets the ABP’s standards of excellence. Upon passing this exam, the candidate is awarded the title “Diplomate of the American Board of Pediatrics” and is designated as “board-certified”. You may see the certificate from the ABP hanging in your pediatrician’s office. Why is it important that I choose a board-certified pediatrician or pediatric subspecialist to care for my child? Pediatricians know about the diseases, symptoms and developmental standards that are specific to children from birth, through adolescence and into adulthood. Maintaining good health -- and addressing the illnesses and conditions that threaten health -- often is not the same in children as in adults. Board certified pediatricians demonstrate their participation in ongoing learning and show how they can apply quality improvement in the care of their patients. There is value, not only in seeing a physician who understands the medical needs of infants, children and adolescents, but who also becomes familiar with your child’s growth, development and health patterns and with your concerns as a parent. The long-lasting relationship that develops between your child and her or his pediatrician is an important component of your child’s care and wellness. How do I know if my pediatrician is certified? Anyone can find out whether their pediatrician is ABP certified and participating in activities to maintain their certification by using the verify certification feature online. Pediatricians participate in a rigorous and continuous process to maintain their certification. Concerned for the well-being of their patients, ABP certified pediatricians are dedicated to self-improvement and continuous learning. Can doctors call themselves pediatricians if they are not certified? Yes. By definition, a pediatrician is a doctor who treats children. Practicing pediatricians have completed a three-year residency, focusing their training in specific knowledge about treating children, from infants to young adults. However, until they have passed an initial certification exam given by the American Board of Pediatrics, they can't call themselves a board-certified pediatrician. Is the American Board of Pediatrics the only organization that certifies pediatricians? The American Osteopathic Board of Pediatricians also certifies pediatricians. Also, a doctor treating children may also be certified in another field, such as Family Medicine. 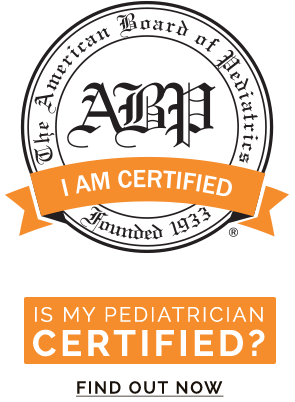 Subspecialists (including allergists and immunologists) may be certified by other boards, too, but most physicians treating children are certified by the American Board of Pediatrics. What is required for pediatricians to maintain their certification? After their initial certification, pediatricians are enrolled in the Maintenance of Certification (MOC) program. Maintenance of Certification is a five-year cycle of learning activities designed to help pediatricians enhance their knowledge in general or subspecialty pediatrics. MOC requires that pediatricians actively engage in ways to apply this knowledge by improving their own practice. In addition, every 10 years pediatricians are required to take another examination to re-test their knowledge and medical judgment. Subspecialists can become certified in a specific area of pediatrics after they complete additional (fellowship) training. The subspecialty exam focuses on knowledge relevant to treating patients with specialized medical needs, such as heart defects, developmental-behavioral issues, or lung diseases. Maintenance of their subspecialty certification is similar to the general pediatrics MOC – a five-year cycle for knowledge and quality improvement activities, and a 10-year cycle for examinations. Note: Physicians certified before 1988 are not required to participate in Maintenance of Certification activities to stay certified, although many choose to document their excellence in this way. What kind of subspecialists does the ABP certify? Certificates are awarded in conjunction with other specialty boards in the areas of: Hospice and Palliative Medicine, Medical Toxicology, Pediatric Transplant Hepatology, Neurodevelopmental Disabilities, Sleep Medicine and Sports Medicine. My pediatrician has the letters FAAP behind his name. Does that mean he’s board certified? FAAP stands for “Fellow of the American Academy of Pediatrics.” The ABP and the American Academy of Pediatrics (AAP) are separate organizations with different purposes. The AAP is a membership organization that provides professional resources for its members and advocates for children and pediatricians in the US. The AAP conducts, facilitates and publishes peer-reviewed research. It also publishes information for parents/the public on its website and in print. The AAP is the largest provider of educational material for pediatricians and pediatric subspecialists in the world; however, the AAP does not certify pediatricians. Although initial board certification is required to become an AAP fellow (FAAP), there are other categories of AAP memberships that do not require certification. Verify the certification status of a pediatrician on the ABP website or through the American Board of Medical Specialties, which lists certifications for many different specialties, including pediatrics.